● Target 1 “Salamangreat” Link Monster you control that was Link Summoned using a monster with its same name as material; that Link Monster is unaffected by monster effects this turn, except its own. Salamangreat Circle has two effects, but you are likely using the first more than the second. Quick-Play gives you flexibility to play it during either turn. RoTA for the Salamangreat deck, goes good alongside Gazelle and your other searchers. Searching on your opponents turn is nice too if you were to set this as a bluff. Protection for a reincarnation link Salamangreat during either turn from monster effects works as a great form of protection. You will always be reincarnation linking your Salamangreats to give them better effects. With this as protection, you are waiting for a monster effect to attempt to clear your field or target one of your Salamangreat Link monsters directly. Do that and you get a 1-for-1 trade which is what you are aiming for if using this as a defensive card. RoTA effect is great during either turn, but for certain during your turn to give you more resources. Salamangreat Circle is a very easy 4/5. It’s a QuickPlay Spell with no cost and the option of two effects. The first is to simply search any Salamangreat monster from your deck to your hand. This dodges Effect Veiler nicely. 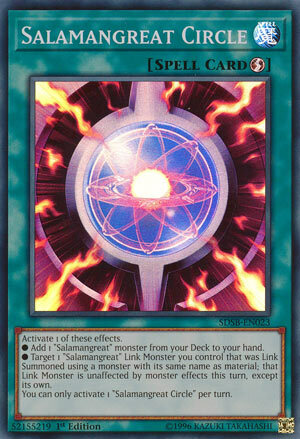 Or you can use it to protect a targeted Salamangreat Link Monster from other monster effects for the whole turn. The Salamangreat monster had to have been Link Summoned using another copy of itself as Link Material, but that happens all the time. However, the second effect is still all defense, so the first effect is really where this will shine. It is a shame that you can’t use both effects in a single turn, but being QuickPlay lets you make the most of the first effect during your turn, or the second effect during your opponent’s turn. Salamangreat Circle is definitely a three-of in the deck even if the picture doesn’t really have anything to do with anything other than fire. Next up is a new addition to the Salamangreat Spell/Trap lineup, and one of the best additions to said lineup from the Structure Deck, Salamangreat Circle. Circle is a Quick-Play Spell with two different effects where you get to choose which one you want to use. The first one is to add any Salamangreat monster from your deck to your hand, which is perfect for any deck to get a searcher with the only restriction being a hard once per turn. This is the primary effect used with this card because it can get you to your advantage generators, extenders, or starter cards like Foxy, Spinny, or Gazelle just to name a few good search options. The only way it could be better is if it searched Spells/Traps, but the combination of Gazelle and later into Sunlight Wolf kinda facilitates that instead or a Foxy Normal Summon can give some good luck. The other effect you can choose is to target a Salamangreat Link Monster you control that was Link Summoned using a monster with the same name as material and said Link Monster will be unaffected by monster effects for the turn that isn’t its own effects. Decent protection option to have if you want to keep your Reincarnation Link Summoned Sunlight Wolf or Heatleo maybe, it is only monster effects, and there’s a fair amount of Spells and Traps that could threaten the Salamangreat Links, but they have protection around that as well, so having this protect the Links from monsters helps you not have to use your disruption so early. You can only activate 1 Circle per turn as you’d probably expect, but it’s still a three of since it is your searcher and being a Quick-Play lets you set it to use on your opponent’s turn if you draw into two of them. Art: 4/5 Things are heating up now. *Target a theme specific Link Monster of yours and if it was Link Summoned using itself as material (and we saw how easy it is to do that last week) it is unaffected by other Monster effects for the turn. I’m not super fond of the first effect, it could be helpful if you need a specific Monster right THEN, and this is probably used better as a defense measure for discard fodder for another play/setup/combo of whatever you’re doing at the time, but it can be useful for you on your turn as well for various plays. I just see more of the prior here than the latter. That effect would be a lot more useful if it could search any theme card instead of just Monsters, but a search is still a search, even confined to Monsters. The second effect is better, you have Links you’re playing, the condition involved is simple, and protection given to that degree, even for a turn, is great. If you don’t have a Link out, you can always just use the first effect. You can only use one of these a turn, so you can’t use the first effect and Link into something for the second effect (but you still could with a different copy as soon as the next turn) given the Quickplay aspect. I like this, but I don’t see either of these effects as super game breaking that this is going to turn the tide of a Duel, or anything like that either. Art: 4/5 The atom and fusion theme here is nice, but I’m not sure what that specifically has to do with the theme, if anything at all.